Results: Even I added 1 tbsp of rum to soften the bananas, I could’t taste any alcohol at all after baking. 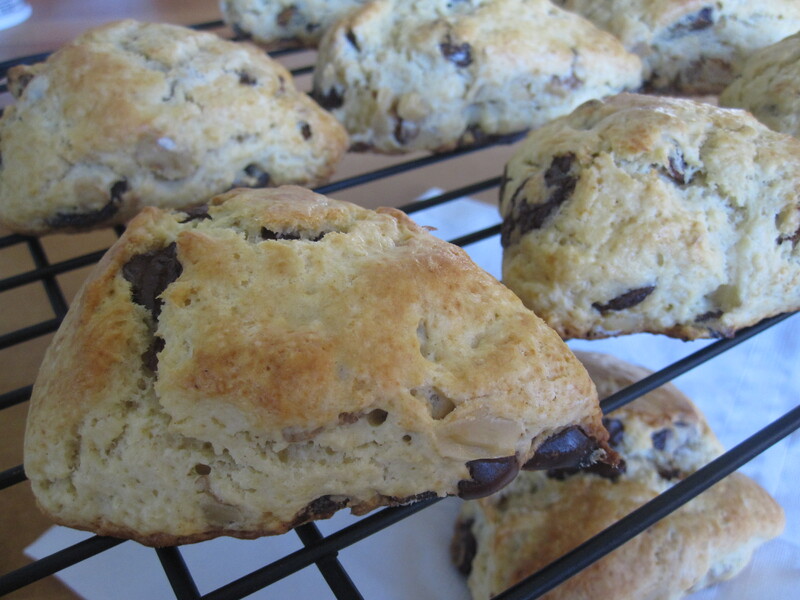 I didn’t want the taste of bananas take over the overall taste of the scones, so I just coarsely chopped. As a result, there are bites of the scones that comes with the sweet fragrance of banana, but no bananas in those bites at all… interesting! In a large bowl, stir flour, sugar, baking powder and salt to combine. Rub in butter until the mixture resembles of coarse crumbs. Add walnut, chocolate chip and chopped dried banana. Toss to mix well. Add eggs, vanilla extract and milk (or cream) in a small bowl, whisk to combine. Scoop out 2 tbsp to reserve for glaze. Pour the egg mixture all at once into the flour mixture. Use a spatula gently stir until the dough comes together. Do not over mix or the scones will be tough. Transfer the dough to a lightly floured surface and knead the dough gently 4-6 times, then divide the dough in half. Pat each half into 6 inch circle, then cut into 6 small wedges, for a total of 12 wedges. Dried banana slices: The banana I used are dried sliced plantain banana that I got from Costco. They are a bit sticky, chewy and a bit dense in texture, so I added 1 tbsp of rum to soften up a little (and rum makes it more flavorful, you can’t taste the alcohol at all after baking). you can substitute rum with water.